Respiratory syncytial virus (RSV) is a leading cause of respiratory illness, including bronchiolitis and pneumonia, in the young, elderly, and immunocompromised. RSV poses a substantial public health threat due to its association with severe morbidity and mortality in infants and premature babies. An RSV vaccine is needed but none has yet been licensed. The first RSV candidate vaccine, a formalin-inactivated virus developed in the 1960s, not only failed to protect against disease, but led to enhanced disease in vaccine recipients upon subsequent natural infection. Since this historic incident, many have attempted to understand the factors contributing to this enhanced pathogenesis and to develop alternative vaccine formulations. However, progress has been slow and frustrating, in part because natural RSV infection does not induce a durable immune response. On a recent episode of TWiV, Vincent and Alan interviewed Kate O’Brien, Executive Director of the International Vaccine Access Center at the Johns Hopkins Bloomberg School of Public Health. In a discussion about pathogens that cause pneumonia and related respiratory infections, Kate provided an optimistic overview of current vaccine strategies for RSV. Because I studied this pathogen during my postdoctoral years, and I am somewhat familiar with the issues hampering progress in this field, this discussion piqued my interest. Passive protection of infants through immunization of pregnant mothers in the third trimester. Maternal antibodies would cross the placenta and protect unborn babies through the first few months of life. This approach is currently effectively used to prevent neonatal tetanus, diphtheria, and pertussis (Tdap vaccine), as well as influenza. Passive protection of infants through delivery of long-acting monoclonal antibodies immediately or soon after birth. This approach would protect infants up to four or five months of age. Active protection of infants via a live-attenuated RSV vaccine. Because newborn infants have immature immune systems, this strategy is likely to be most effective in infants older than six months of age. An ideal approach would involve combining two of these strategies. Such a passive-active combination would protect unborn and/or newborn infants via delivery of maternal or monoclonal antibodies (strategy 1 or 2, respectively). This protection would be extended by delivery of an infant vaccine after six months of age (strategy 3). The RSV F (fusion) protein, which is the target of the monoclonal antibody palivizumab, is highly conserved and elicits broadly neutralizing antibodies. Recent studies have shown that the majority of neutralizing activity in human serum is directed against the pre-fusion form of protein F, inspiring the development of an RSV pre-fusion F vaccine. Using the Tdap vaccine as a control, a recent set of observer-blinded, Phase II Clinical Trials aimed to investigate the safety and efficacy of such a formulation as a potential maternal and older adult vaccine. The vaccine was well tolerated and boosted pre-existing RSV neutralizing antibody titers to a level that would provide protection to a potential infant until four months after delivery. Although the study was conducted in non-pregnant women, thirteen women became pregnant during the study, nine of whom gave birth to healthy, full term babies. The other four pregnancies resulted in two induced and two spontaneous abortions, none of which were assessed to be related to vaccination or any observed congenital anomaly. Newborn infants are among the most susceptible to infection with RSV, yet there are no RSV vaccines that are both safe and effective for this population. 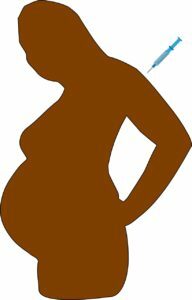 Vaccination of pregnant women could provide passive antibody protection to infants during this stage of profound vulnerability.